We are excited to announce that we have released a new Mobile App for your smart device! 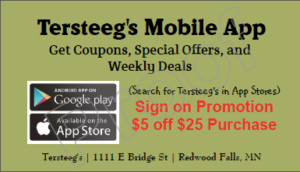 The app is filled with Coupons, Deals of the week, Loyalty Rewards and more. You can also view our weekly ad and create a shopping list. Get $5.00 off just for signing up! Ask a store associate for more details.